Preheat oven to 350 degrees F. In a medium mixing bowl, whisk together flour, baking powder, salt and Swerve sweetener (or other granular sweetener). Make a well in the center of the bowl and add softened butter and cream cheese and cream together with wooden spoon. Stir in egg and vanilla extract and mix until blended. 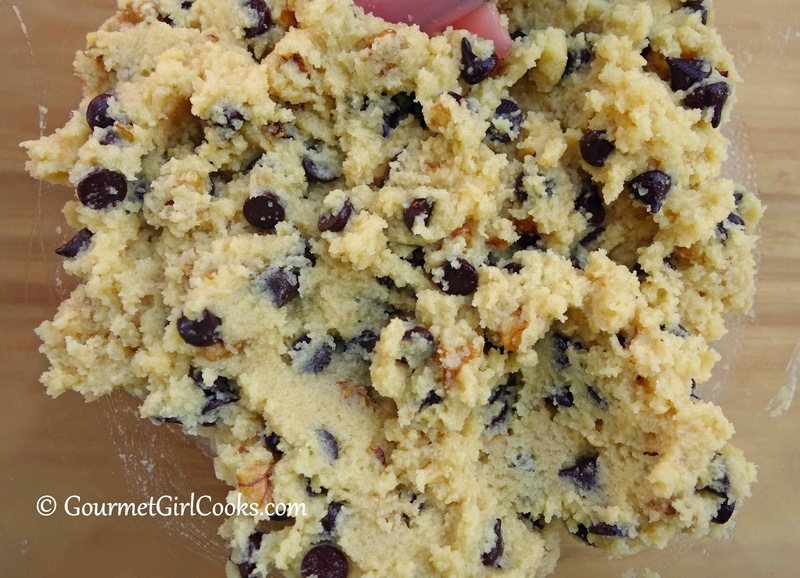 Fold in walnuts and chocolate chips or chunks and mix just until blended. Drop by slightly rounded tablespoonfuls (or use a 1-tablespoon sized retractable scoop) onto a parchment paper lined cookie sheet; press down with fingertips to approximately 1/4-inch thick rounds. Bake for 13-15 minutes or until light golden brown. 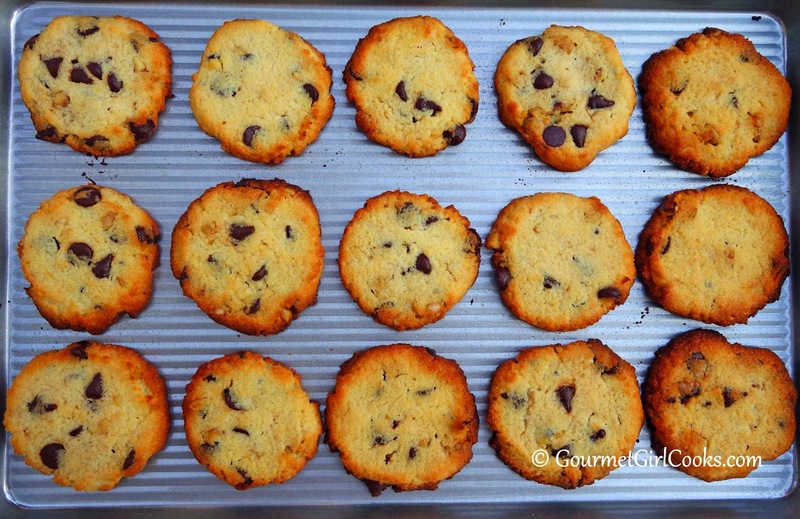 Cookies are soft when hot and crisp as they cool. Let sit 5 to 10 minutes and transfer to a rack to cool. Makes about 3 dozen medium sized cookies. These look positively delightful! I've noticed that when I bake stuff on my ancient, dull baking sheet, the crusts get a deeper color than when I use my much newer shiny one. I'm not sure whether I like soft or crispy cookies more ... better bake a batch of each and "experiment"! :-) Note to myself: better stock up on the chocolate chips ... and the cranberries,too! These look very good, and I am in the crispy, thinner cookies camp. I just baked some peanut butter cookies this afternoon so these will be made next week.....thank you for doing the experimentation for me, you have a wonderful blog and I pin your recipes all the time! Thanks for the recipe, they are baking now. I was wondering if you had the nutritional value (carb count mostly). Thanks again! Hi Ayla - I've been making your Choc. Chip Cookies with Toasted Walnuts and Ricotta ever since I went grain free/low carb. They are my 'go to' cookie and I love them! Now I'm anxious to try these as well. I'm wondering if there is a reason you do not cream the butter/cream cheese with the Swerve in a mixer as is the norm with most cookies I'm familiar with? Thanks for all of your wonderful recipes, another favorite of mine is the Chicken Pot Pie with Cheddar Herb Crust - will make that again soon now that the cooler weather is here. So happy you are enjoying the cookies. I need to make the Chicken Pot Pie again soon, too since it's finally chilly here! Hi GG - I'm making these right now! Thanks for great recipes!! I recently stumbled across your fabulous blog and am saving your recipes to try, starting with this one this morning. I have been LC since August and am loving it, and have lost 24 lbs so far. I would like to lose about 10 more but it's getting more difficult now. Also, drinking wine 🍷 doesn't help - LOL. I clicked on the link for the chocolate chips and they are noted as unavailable. Any other sources you are aware of? 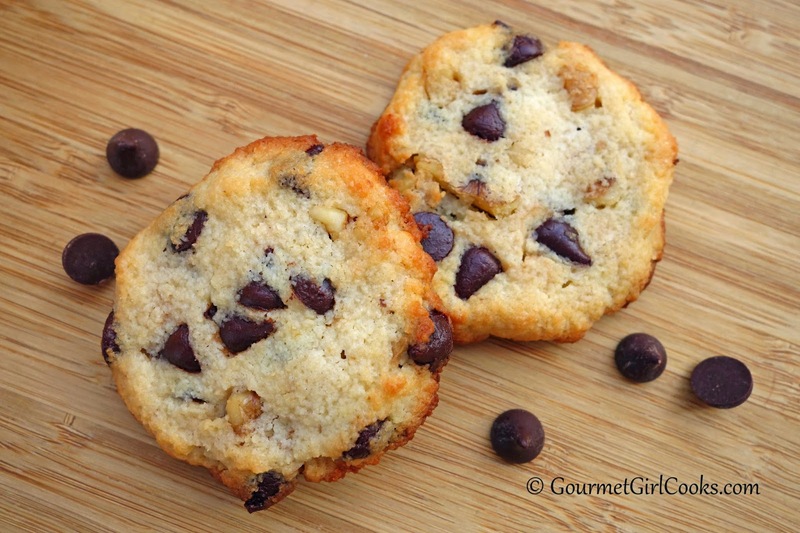 These came out soft and kind of crumbly for me but the flavor is outstanding! Was really excited to try these. I have discovered since going gluten free that i appear to be much more textural than the average palate. Anyways they have some crisp to them, but still end up with that not wheat flour mushy texture for the finishing sensation. I used super fine blanched almond flour, because I read on another of your recipes coarseness can play a role. Made them on my go to heavy jelly roll pan with a silicone mat. 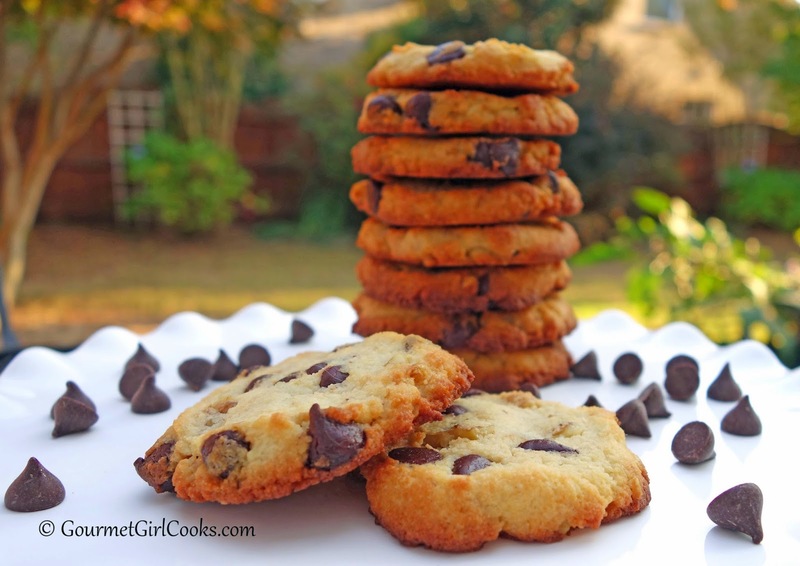 That being said, they are hands down the most delicious gf cookie recipe I have made. Sadly my kids love them too. Lol. 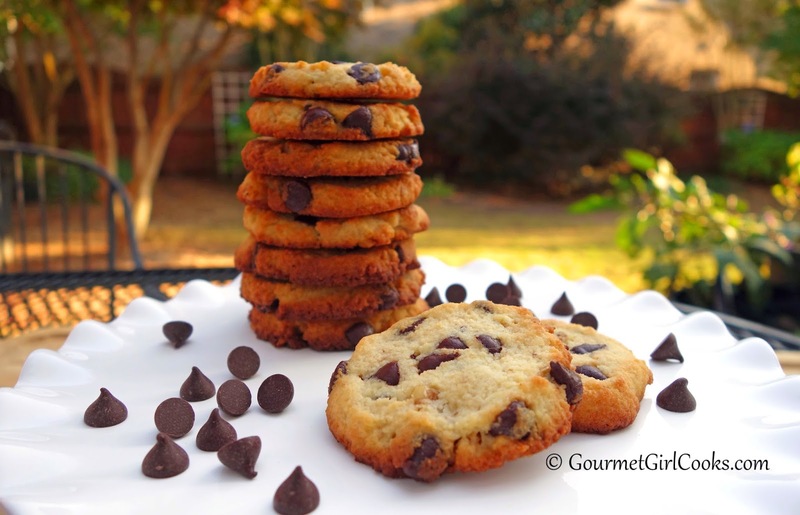 I just made this cookies and flavor is delicious, unfortunately not crispy enough for my hubby. I need to know how to store them and how long I can keep them for. Also, would you let me know if the shortbread cookies would be crispier? I don't want to have to cook a sugar crispy cookie recipe for him.